I made it to East Tennessee! *happy dance* And I have to tell you, The Powers That Be were determined that I not get here in a timely manner. I left the office (in Nashville) at 1:30p. Got stuck in traffic, and 15 minutes in my phone died (I don't have a car charger). So, I went back to the office, plugged in, charged up and left at 2:30p. Somewhere along I-40, someone lost a big red gas can. My bumper found it. I pulled over to the emergency lane and yanked it out from under (my poor car!). Arrive in Knoxville to find a detour ... that takes me around the city. I missed one of the connections and had to back track. That cost me 45 minutes. Ok ok, I'll stop all the whining. I'm here, and I'm alive, and I'm beat. So I'm going to rest up because I've got more photo fun tomorrow! 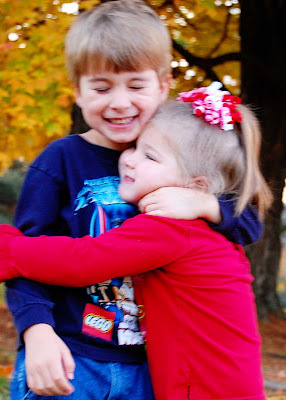 For now, here's a sneak peak at the sweetest siblings from yesterday.